Showcasing the ultimate superhero showdown in a pocket-sized format, Funko Batman v Superman Mystery Minis include 12 figures from the major theatrical release. Building on the figures found in the Funko Pop! product for the movie, Mystery Minis shrinks things even further and adds in a blind-box element. This means that the figure in each box is a surprise until it is actually opened. 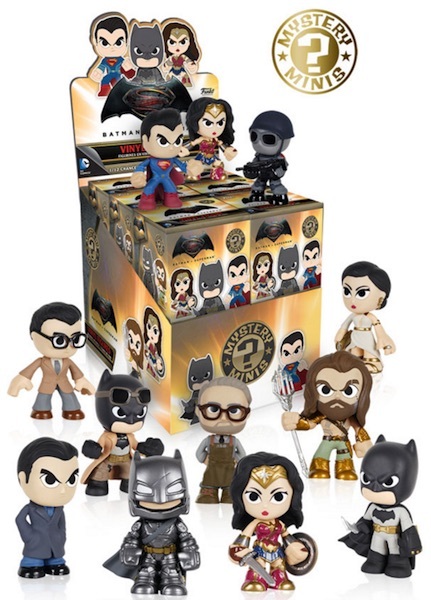 A total of 12 figures are included in the set, with multiple options for Superman, Batman and Wonder Woman and also additional choices for the non-superhero figures such as Bruce Wayne, Clark Kent and even Alfred. Even Princess Diana of Themyscira, the alter-ego of Wonder Woman, is featured. While many of the Mystery Mini sets include short-printed figures, no odds were provided. However, with exactly 12 figures available, it is possible that each subject drops at the same odds given that cases come with 12 figures.